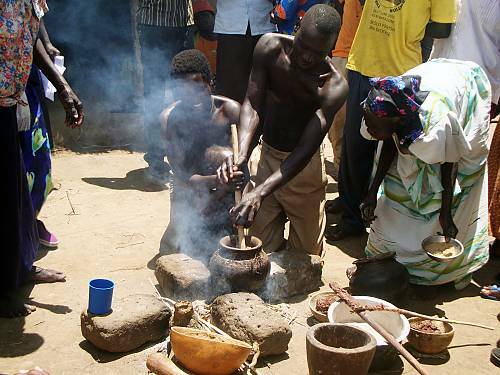 The male-child cleansing ceremony, performed among the Lango people of central northern Uganda, is a healing ritual for a male child believed to have lost his manhood. 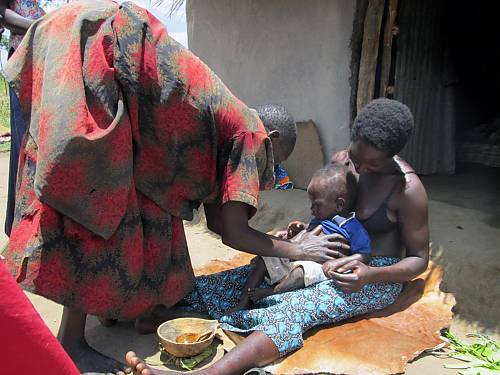 During the ceremony, the mother and male child spend three days inside the house and eat unsweetened millet porridge. The child is treated as a baby for the duration of the ceremony. On the third day, they exit the house and sit at the entrance, accompanied by a paternal cousin. 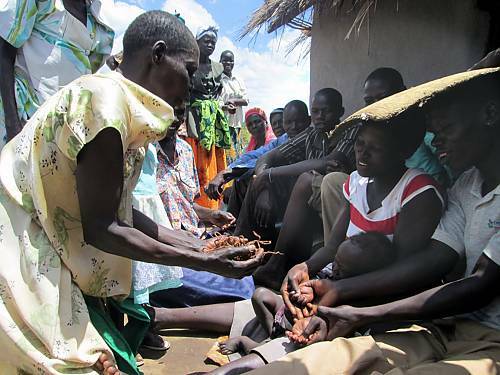 The child’s hair is cut and woven into strands, which are mixed with softened ficus bark and shea butter, then tied around the child’s neck, wrists, and waist. 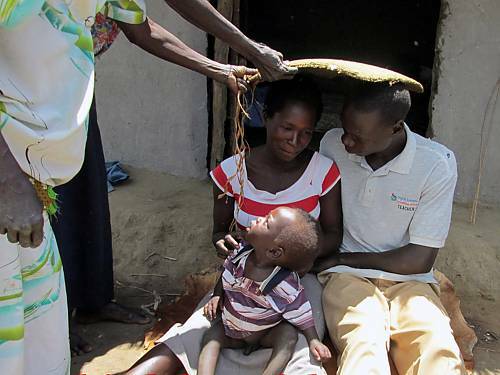 Remaining strands are rolled into a ball, and thrown three times to the mother, cousin and child. 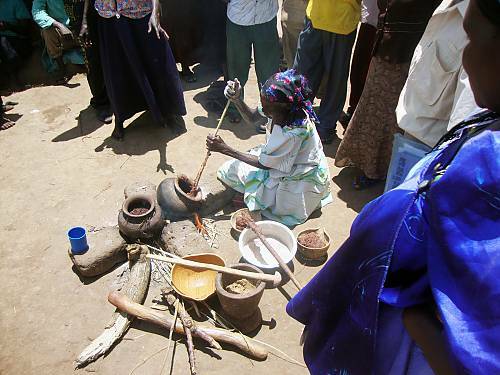 The three are then smeared with shea butter and served pea paste, millet bread and a millet-yeast brew. Jubilations begin thereafter with ululations, singing and dancing, confirming that the child has regained his manhood. 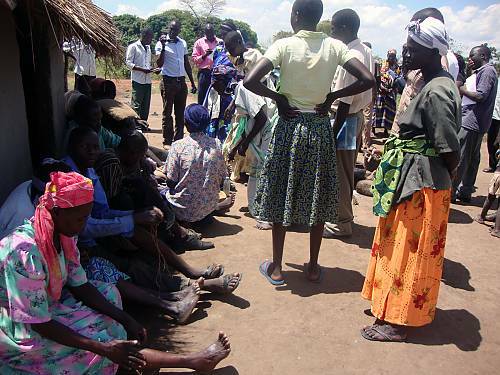 The ceremony promotes reconciliation and restores the social status of the child. Limited practice, however, is affecting its viability. Many bearers are aged and the practice is increasingly performed in secrecy for fear of excommunication. 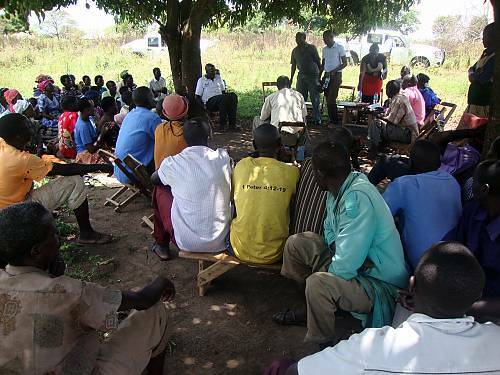 Community members of Ngamii village in Dokolo District holding a dialogue meeting in preparation of to choose the boy child for the performance the boy child cleansing ceremony. The boy child supposed to undergo the cleansing ceremony is being held up and presented to the community members before taken into the house to start the mandatory 3 days ceremony. 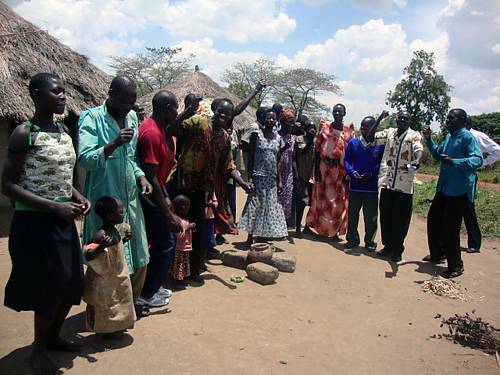 Community members join in the cultural dance performed shortely after the boy child is taken into the house to undergo the male child cleansing ceremony. The male child and his mother are brought out of the house covered with a winnower and made to sit in front of the house after the completion of the 3rd day of the ceremony. They are joined by the cousin of the boy's father to perform the last rituals of the cleansing ceremony. The mother-in-law and the elderly community members take part in the making of rope like strands from the chewed bark of a ficus tree. The soft bark is woven together in a rope like object with the hair of the child and mixed with shear butter oil. Ropes made out of ficus bark and the child hair is tied by the grandmother on to the child's neck, on the wrist and one with a knot around the waist. The mother of the child has also a rope tied around the neck. Rope like strands not mixed in shear butter are rolled into a ball like object and five family members are chosen to ask for blessings by throwing the ball to the child, mother and the cousin. Food is prepared in a traditional way at the end of the ceremony to be served to the three key parties - the male child, the mother and the cousine. Community members too are served. The male child, the mother and the cousin and smeared with shear butter by the mother-in-law together with the elderly members of the family. The boy child, the mother and the cousin take part in the preparation of the meal that is after being smeared with shear butter. The meal is served to all but the cousin eats food on the mingling sticks behind the house and then throws the sticks over the house.